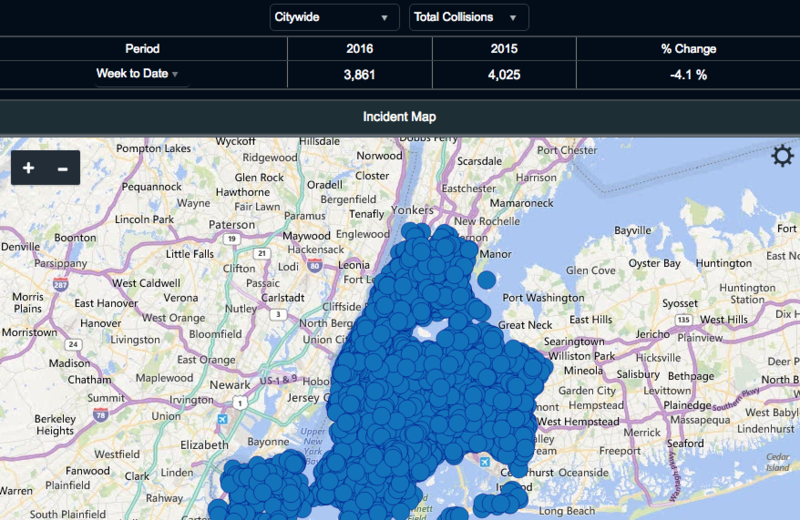 Last week, the NYPD unveiled an online view of “TrafficStat,” the department’s system for tracking traffic crashes. While the site has some data that’s not available on DOT’s Vision Zero View tool, it leaves a lot to be desired, according to the government accountability and transparency watchdog Reinvent Albany. In a blog post today, Reinvent Albany notes that the TrafficStat site merely maps data that was already available. And crucially, NYPD’s portal lacks data about where police are enforcing traffic laws, which the agency has refused to release for years. At the very least, the TrafficStat map ought to directly link to the data on the open data portal. Currently, users have to click “Additional Information” on the TrafficStat page, then click “Maps & Data”, and then scroll to the bottom of that page and click the link to the data in the disclaimer. However, this takes users to the Department of Transportation’s Vision Zero data set. It does not appear that the NYPD links to its own data (with summons) anywhere.